Big, beautiful windows don't have to be energy siphons. UniFrame bays and bows are built to stop energy loss while letting in all of the beautiful outdoors. 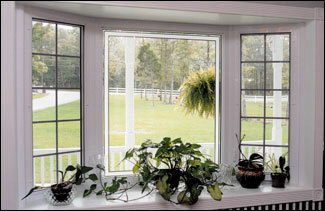 Bays and bows are available in double hung or casement styles. For added security, our easy-to-reach multi-point casement locking system has multiple locks along the entire window jamb - all are activated simultaneously by a single locking handle. Optional Easy-Clean Glass requires cleaning half as often - with half the effort. Intercept warm edge insulated glass offers increased strength and higher R-values -- standard on most products.